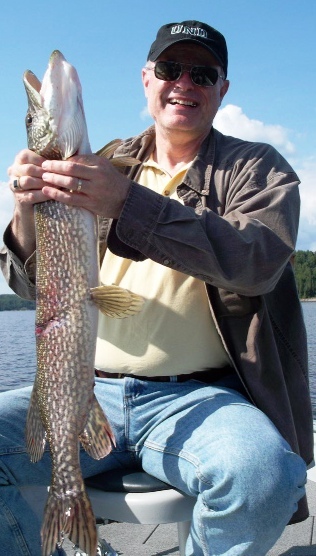 Our man is invited on an all-expenses paid fishing trip to the deepest reaches of northwestern Ontario. Exclusive lodge in the middle of nowhere, accessible only by float plane. Four star accommodations including maid service in actual buildings—no tents, no pop-up campers, no sleeping bags, no falling into latrines. Instead, modern facilities, a beautiful 26-mile lake and experienced guides who take you where the fish are and hand you a beer when you say would you hand me a beer please? His high roller host says the guides put the bait on the hook for you. They take the fish off the hook when you catch one (and you will catch plenty). Most of the fish caught on this catch-and-release lake are either too big or too small to keep. But the medium sized walleye end up in unforgettable deep-fried shore lunches. Of course, specially prepared gourmet breakfasts and dinners are served daily in the lodge dining room. Our man, a low roller who styles himself an avid indoorsman, is intrigued by the word beer. Yet he feels obliged to warn his inviter that he hasn’t been fishing since he was eleven. Ever since, our man has avoided fishing poles, tackle boxes, even sidewalk-squashed worms. He went fifty long years with the oppressive guilt of his crime hanging over his head, and has nightly prayed to St. Luca Brasi, patron saint of those who sleep with the fishes. When a fish killer breaks free from The House of Guilt, even after fifty years, he is still a fish killer, weak and susceptible to temptations dangled by a high roller host. No problem, says the host. We have fishing gear, we’ll show you what to do. You’ll love it. To make a long story into a mercifully short fish tale, our man accepts and goes fishing. The accommodations are superb, the shore lunches unforgettable, the beer plentiful. And his haul is unbelievable. In three days he has landed fifty-two walleye and pike. Crossing back into the states, the border patrol agent asks where he has been. “Fifty-two walleye and pike,” he replies, the pride in his voice difficult to conceal. This entry was posted in The human comedy and tagged banjo, Canada, funny, humor. Bookmark the permalink. Your bartender write the illiterate compliment?